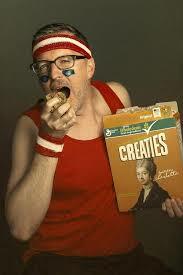 Come Get CREATIVE WITH US And Matt Olin at Creative Mornings - Learn How to Snag Your Ticket! — Enderly Coffee Co.
Come Get CREATIVE WITH US And Matt Olin at Creative Mornings - Learn How to Snag Your Ticket! 1. Where did the idea for Creative Mornings originate? CreativeMornings was launched in 2008 in Brooklyn by my friend, Tina Roth Eisenberg. My team and I have to honor of running the Charlotte Chapter (Chapter #123!) since we launched in 2015. 2. From where do you draw your "surge of inspiration" that you're sharing with other Creatives in here in CLT? Haha. A refer to myself as a "Genetically-Predisposed Copywriter" because I’ve been practicing the art of differentiation since the womb. I don’t like being confused with others -- and as it turns out, neither do my clients! 5. How can local entrepreneurs help foster and support creatives in CLT? This could be an exhaustive list, but one way is for more of our brick-and-mortar entrepreneurs to commission murals on their buildings. All over Charlotte. Not only does this support locals artists, but it also changes the visual landscape of our city in a gorgeous ways. 6. How long have you been in CLT? 7. If you had to tweet to promote one thing about CLT, what would it be? Charlotte's creative energy is surging, and it's the best time ever to be a creative thinker, maker and/or doer here. 8. Favorite treat - sweet or salty and from where? Ice cream. Two Scoops is delicious. 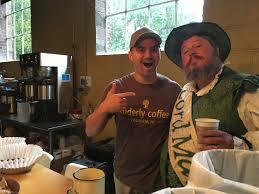 I think I first met Tony at a Hygge meetup, and got to know him better as he became one of out beloved coffee partners at CM/CLT. My first impression? Totally sincere and passionate dude. 10. What advice would you give to a newbie to the creative scene in CLT? Carve out the first Friday morning of your month and start attending CreativeMornings/Charlotte ASAP! Visit Creative Mornings Website and sign up for the newsletter (Tickets are VERY limited and go VERY fast, so getting the email reminder will be your best bet). Unfortunately this month is all sold out, but sign up to be the first to know about next month's event. Get on the waitlist atleast for this month's event. Sit by your email box at 8:29 AM on the Monday that tickets will be released so you can snag your free ticket at 8:30 AM when the email hits your mailbox! Attend the event May 4 from 8:30am - 10:00am hosted at Resident Culture Brewing Company or an upcoming event.